To start, here's a memo watch from 1984. And here, thanks to Marconi's Wireless Telegraph Company, is the latest amazing wonder of directional wireless, which could allow London Croydon pilots to fly in a perfectly straight line, or to land, through cloud, or even at night!!! I love dial telephones and have a few of them in good working order. Me and my fellow mechanical craft apprentices all started buying and using these about halfway through our (1974 to 1978) apprenticeships. The slide rules we'd all outfitted ourselves with were suddenly obsolete. I still remember the maths lecturer (in love with his slide rule) grumpily saying " Oh yes, those are all fine and dandy, but what good are they if the batteries run out?" That was the first calculator I ever saw. I couldn't afford one though. I actually got some weird reverse logic calculator first, which wasn't so bad because no one else could work out how to use it (you had to sum 2 + 2 rather than 2 + 2 =) and so no one ever wanted to borrow it from me. When only half the class had a calculator you could find it going right around the whole class. Yeah it cost me like two weeks pay! Had to save for a few weeks to get one. They came with a fancy wallet with two belt loops, nobody ever wore it like that. Ah! The "were so amazingly primitive that they still though digital watches were a pretty neat idea" thread. My first calculator was like this one. We were all especially impressed that you could write ShELL OIL on it if you turned it upside down. And it was no use getting used to it, because you could only use sslide rules in exams. 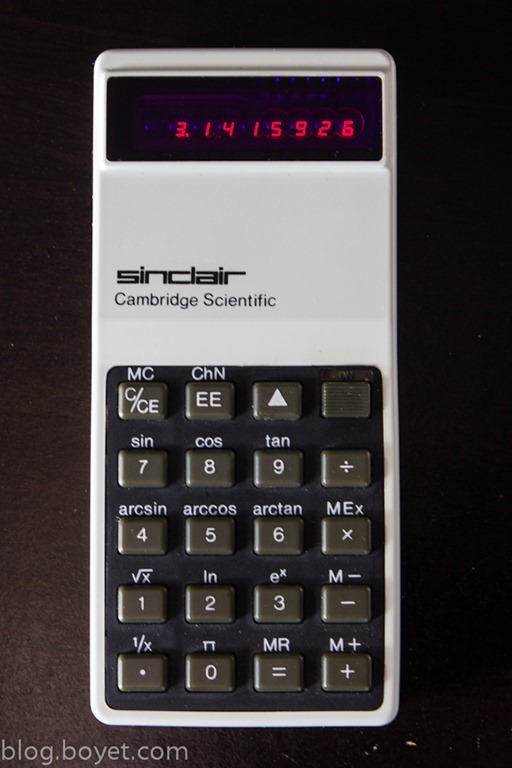 The Sinclair calculator was (as usual for Sinclair) a triumph of cost-cutting. If I remember correctly, they did things like reduce the number of digits they calculated in operations where they weren't really required, so they could free up a few bytes of program memory to add extra math functions that competing calculators didn't include. I'd never seen a real one until I went to the Science Museum a few years ago and they had one on display. I like the line from "Hitchickers Guide To The Galaxy". At one point Arthur Dent's right arm goes floating away when he passes through improbability space. "How am I going to operate my digital watch now?" This is a reference to when watches had LED displays instead of liquid crystal today. To save batteries the face was blank until you pressed a button! Planes still use this technology. It sounds like a marker beacon used airport approaches, or a VOR before the direction needle was added. On the calculators - I lost my nice TI calculator in the late '80s, and started taking the family Sears LED scientific to school - along with the power cord. I just started sitting in a desk next to a wall outlet. As far as I know it still works. I still own 16mm, 8mm and 9.5mm film projectors. They are all in working order (at least they were the last time I used them). The 16mm also handles sound and comes with a really bad speaker. The Pathe 9.5mm had a worn metal belt drive, which kept slipping so I replaced it using an O Ring and a blob of superglue. Also, the bulb was blown so I replaced it with a halogen but then had to create a swinging arm for it in order that it didn't burn film when stationary. It worked perfectly when in operation (start the film moving then swing the halogen into place and off it went). I suppose that makes it an old/new tech hybrid. I still have my slide-rule. Now that's really old tech!!! I still have my log tables (unfortunately my slide rule disappeared in one of my house moves). I mentioned this on a thread somewhere else in Chronicles, grandson came to see me and he'd brought an old slide rule to ask about it. Maybe 18 months ago now, I grabbed it and said "Right, what you do is, er, um..... er"
I still have mine as well. I can remember life before the internet.